Mountain View police on Friday announced one of the largest seizures of opium poppy pods in California history and certainly the largest ever in the South Bay city — 4,050 pounds. Officers this week found 50 pounds of opium poppy pods and $30,000 in cash in the Monroe Drive home of Jasvir Singh, 34, and his wife, Donna Santo, 45 – both of whom have been arrested. 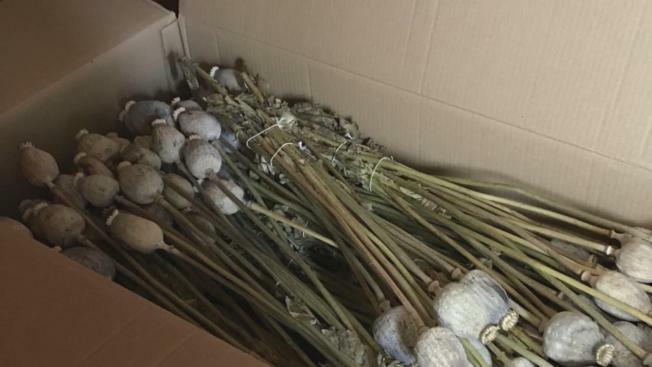 A search warrant also led police to a nearby storage locker where they found an additional 4,000 pounds of opium poppy pods, with an estimated street value of $400,000. “The shipments are from Great Britain, but beyond that, we don’t know where the poppies were coming from,” said police spokeswoman Katie Nelson. Police say the case involved three months of surveillance after someone called in a tip about Singh, claiming that he was processing and selling opium poppy pods out of his house. Singh and Santo are believed to have stored the shipments in lockers. They are also accused of grinding the poppy pods into a fine powder that was brewed into a tea that causes nausea, slow breathing and vomiting. If high doses are consumed, police say, the tea can be lethal. But investigators caught a break on Tuesday, which led to the couple’s arrest. “A customer was observed coming to the apartment and leaving with a box of opium powder, and he said he bought it from the suspects,” said Santa Clara County Deputy District Attorney Bobby Philbrook. Singh and Santo have been charged with felony possession of controlled substances for sale and child endangerment, police say. They are being held without bail in Santa Clara County’s Elmwood Jail. The suspects were arraigned Friday and are due back in court on Wednesday at which time they are expected to enter their pleas.